Selfie of my upcoming Game — Welcome to the GameSalad forum! 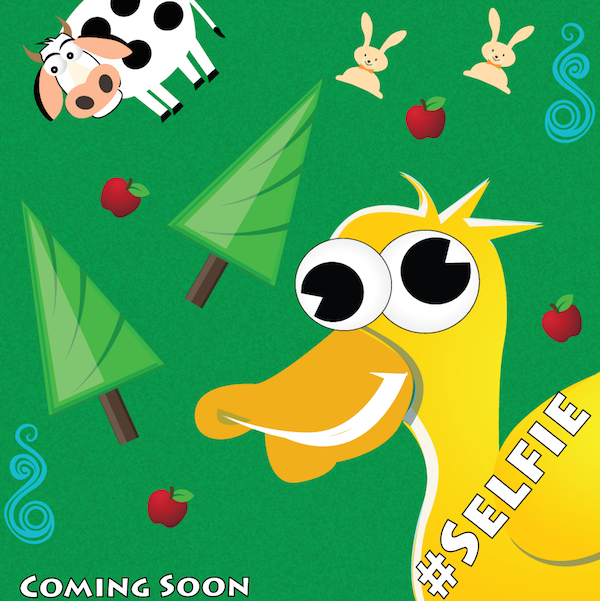 Here is the selfie shot of my upcoming Game enjoy!! Let me know how it looks..
More details will be coming.. follow me on my facebook.. Your "Selfie" doesn't give us or anyone else any type of visual clues to what your game is going to be about. I would think a selfie and or a screenshot you will be required to give when uploading (to Apple at least) should be able to almost tell the story or description of what your game is about. Of course not games do this...and some don't and is almost implied when you see the makers name listed in the apps description. Your bunnies for instance are not standing straight up and down and their position implies they must be sitting in the grass...the same for the cow....turned like they are doesn't "jive" visually. Do you have a game title to go with this image...they may the key to understanding the selfie a bit more. I'm not trying to discourage you....steer a bit yes maybe. I like it! Can't wait to see more! @Thunder_Child thx for your comment.. Actually this isn't taken directly from the game but I just made a poster to attract people (but characters are actually).. however I will like to keep the name a bit secret so not to expose the secret funny part .. Well the game is side scrolling game (a sort of)- something new and different that you will see!! I `m sure you will love it!! its in final stages of development!! Here is my game cutie cat thanking u @Thunder_Child @tappwater Games !! Ah. Ok excellent poster then :-). @Nabbo Lookin' good, can't wait!